Recently, however, I’ve become obsessed with a not-so-famous boxer from the 1920s. So, despite my complete lack of knowledge, next month I’ll be writing something about about him and his career. Usually, when I stray too far from boxvox’s primary bailiwick, I try to cover my tracks with some paper-thin, package-related rationale. box (n.1.) Old English box “a wooden container,” also the name of a type of shrub, from Late Latin buxis, from Greek pyxis “boxwood box,” from pyxos “box tree,” of uncertain origin. box (n.2.) “a blow,” c.1300, of uncertain origin, possibly related to Middle Dutch boke, Middle High German buc, and Danish bask, all meaning “a blow,” perhaps imitative. I won’t, therefore, have any etymological excuse when I post my 1920s fistic research next month. 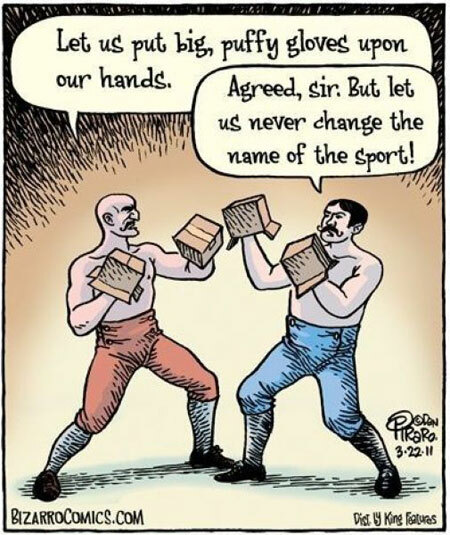 Still, even though the container and the sport are not related, Dan Piraro and I are not the only ones who thought they should be. Lots of people have envisioned boxes boxing. 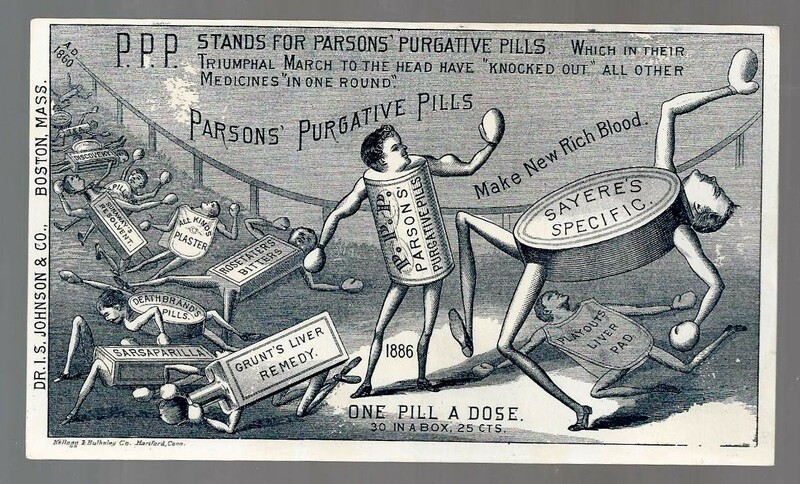 Similar to that vintage advertising postcard with patent medicines in a prize-fight. Only here it’s all about the homonyms. This episode was mainly about boxes as packaging, although it takes its title from a television set that was delivered in a box. The gag about boxes boxing in a boxing match was the punchline and the last straw for Squidward, after all the packaging shenanigans. 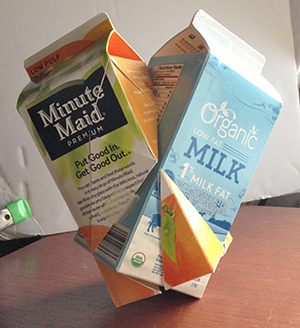 In our previous post we showed you a hypothetical structure for a pair of intersecting milk cartons. Labeling these cartons posed some communication problems for their designers. Since the twin packs are separable, each carton must show its correct individual volume. But, the dairy would also want to highlight the twin pack’s combined total volume. 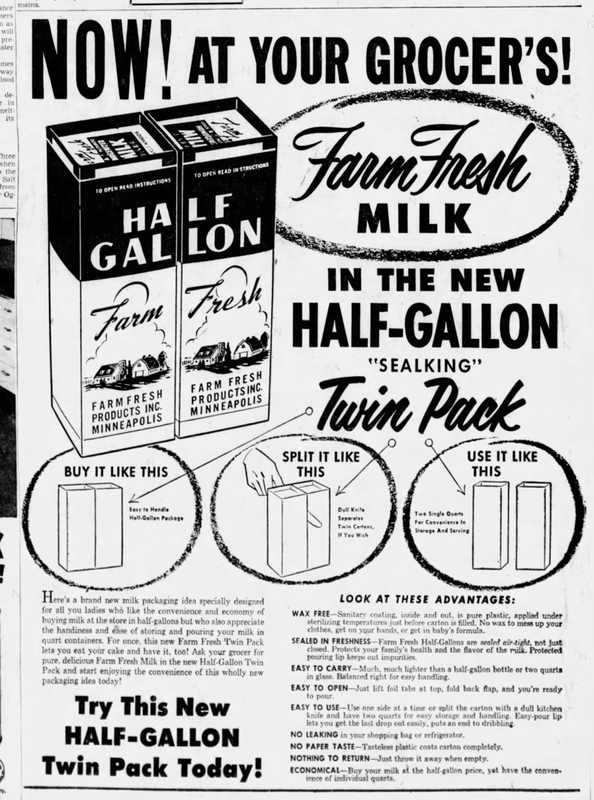 Sometimes they solved this by printing the total volume in words (“HALF GALLON” or “ONE GALLON”) spanning across both cartons. Other times the cartons are just the same as the ones sold individually, and it’s only the handle that shows the total combined volume. As popular as these were with consumers, they were surprisingly controversial in Pennsylvania. From the articles I’ve skimmed, I gather that, in the early 1960s, Country Belle Cooperative Farmers tried to introduce the twin pack (already in use in many other states) to Pennsylvania. For day 4 of “Polyhedral Milk Carton Week” we promised to bring you evidence of International Paper‘s collapsible milk carton. I was hoping to find some decent photos of their Space-Pak™ carton showing its side panel score lines. But the best I’ve been able to come up with is the magenta “specimen” (above) from their 1995 trademark filing. 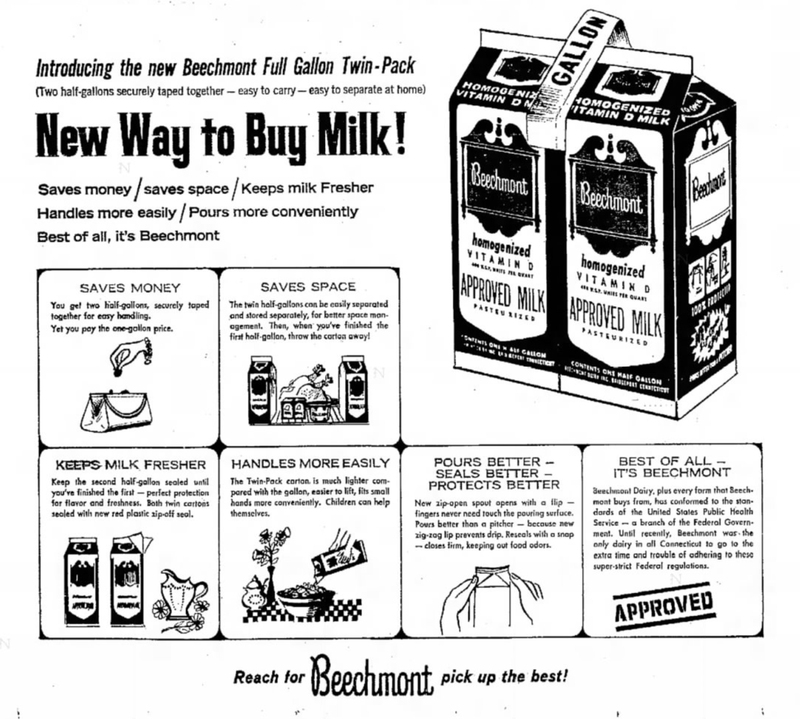 The company touted its collapsible design as a way of making milk cartons more practical to recycle. Because environmental concerns are critical to our customers, our liquid packaging division has responded with creative solutions. 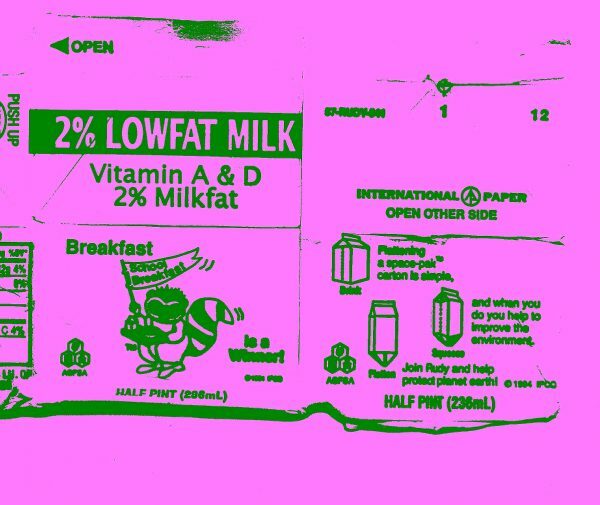 One example is Space-Pak, a half-pint milk carton used widely in schools. It flattens when pressed along scores on two sides, reducing volume and taking less space in landfills. Is it true what they wrote? (“used widely in schools”?) I’ve looked for evidence of this and found hardly any. For day 3 of “Polyhedral Milk Carton Week,” let’s talk about this black and white photograph entitled, Wandering Stars. 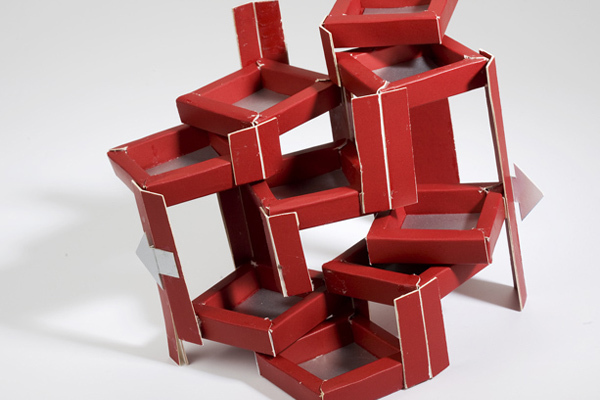 Oliver Helfrich made these gable-topped polyhedral paper sculptures for the 2010 book entitled The Book of Paper. Sharing authorship of the image, of course, is Antje Peters, co-author of the book, who made the photographs. From milk cartons to tissues and take away coffee cups, paper plays an integral role in our day to day lives and yet we often take it for granted. 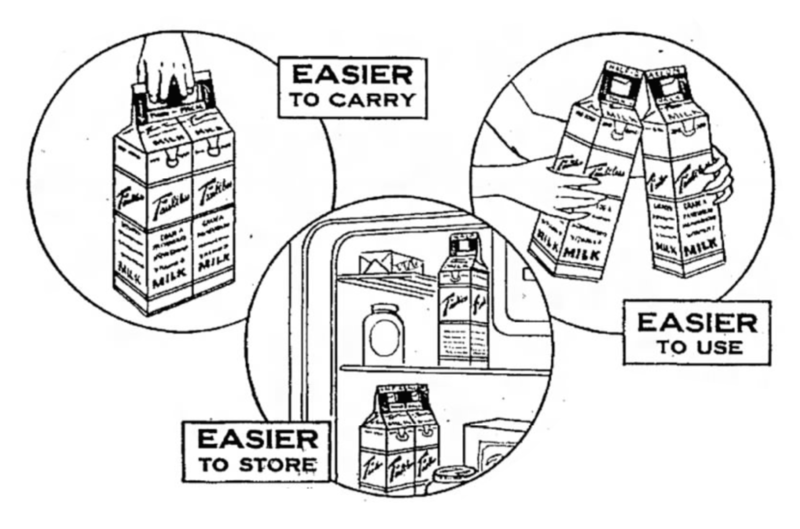 They did mention “milk cartons” in the press release for the book. But nowhere can I find any further discussion of the Wandering Stars construction. Not sure why they gave these abstracted milk cartons that particular title. The ancient Greeks called planets “Wandering Stars” (ἀστήρ πλανήτης) and they named the galaxy after milk (γάλα, gala). Maybe that’s the reason? But, then again, it might mean something else altogether. We’ve seen lots of packaging patents for collapsible bottles and the like. 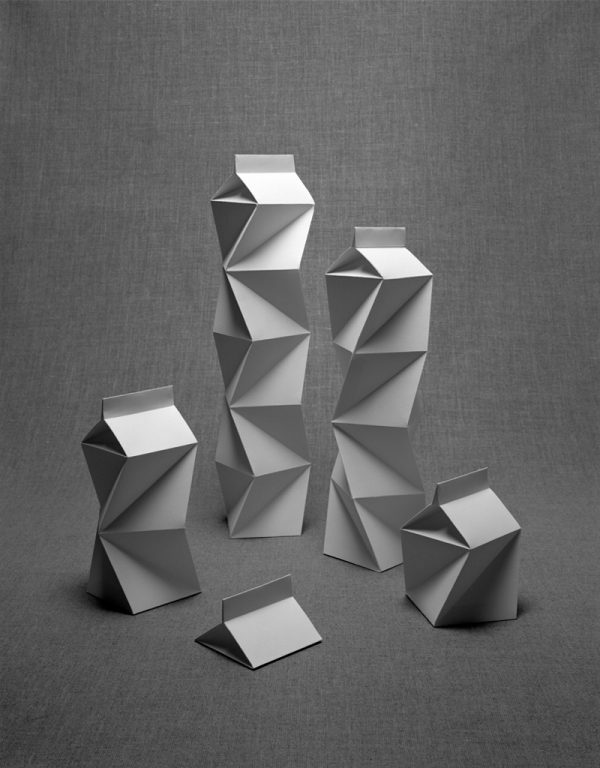 Here, Helfrich has whimsically invented some geometrically-collapsible milk cartons. 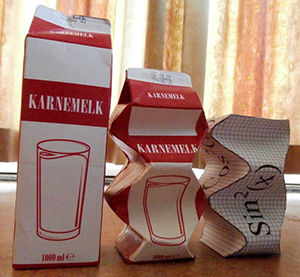 The varying heights suggest a sequence, although it’s open to interpretation whether these cartons are being collapsed or extended. 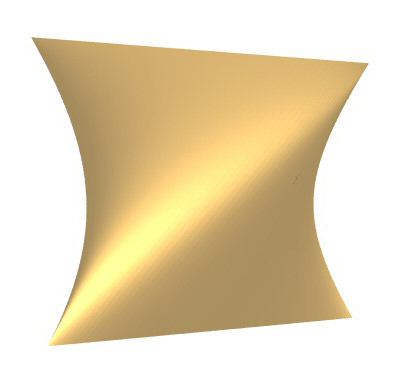 I found out about this on the French website, mathcurve.com, an online ENCYCLOPÉDIE DES FORMES MATHÉMATIQUES REMARQUABLES. Looking more deeply into this somewhat hyperbolic milk carton, however, I think that it was really named berlingot and then the website translated the word into English. If you look up the definition of “berlingot” you find that it has two meanings. 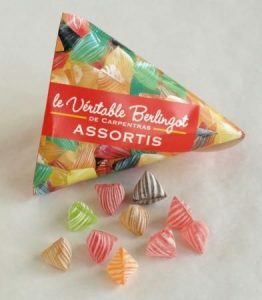 It can mean either a tetrahedral-shaped twisted hard candy, or a tetrahedral-shaped (Tetra-Pak) carton. And (in the real world) one of these definitions can sometimes contain the other. 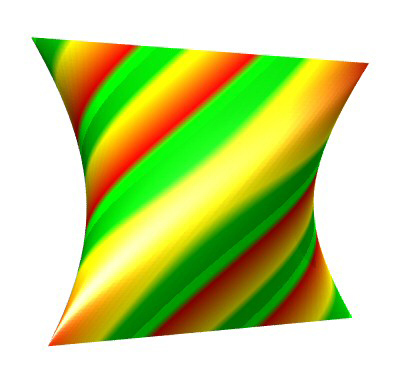 As if he merely crushed them and they naturally assumed this torus-shaped form. Of course, that may just be a translation thing. Ruth Asawa‘s 1984 paper maquette (on the right) tell us that her 1986 sculpture, Aurora, had more to do with origami than milk cartons. 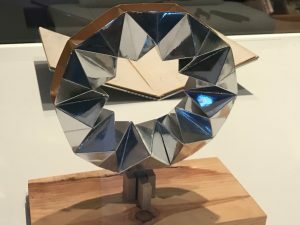 Seen alongside of Westendorp’s milk carton torus, however, it’s clear that she could have constructed it with milk cartons.